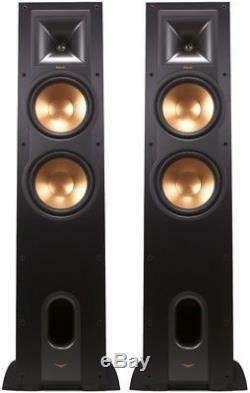 Klipsch Reference R-26F Speakers (Pair) give a superior Reference Series performance. These floorstanders are perfect for those who are serious about their movies and music. Klipsch Reference floor-standing speakers feature Klipsch's 90x90 Tractrix Horn technology matched with an aluminium tweeter, for the most impressive high-end response and great extension, which enhances imaging and powerful dynamics. This creates the cleanest, most natural sound possible. Klipsch' exclusive Tractrix Horn technology and aluminium tweeters deliver the most impressive high-end response and greater extension, enhanced imaging and powerful dynamics. The Linear Travel Suspension (LTS) tweeter minimises distortion for enhanced, detailed performance while the copper-spun Injection Molded Graphite (IMG) woofer provides a remarkable low-frequency response with minimal cone breakup and distortion. Paired together, it provides the highest speaker efficiency in its class. LTS Tweeters have been a hallmark of previous Reference lines, as well as flagship Klipsch Palladium series, making it a core component of some of the best speakers in the world. Injection Moulded Graphite (IMG) woofers are exceptionally light while being extremely rigid, providing remarkable low-frequency response, with minimal cone breakup and distortion. When paired with the Tractrix Horn-loaded LTS tweeter, it provides speaker efficiency highest in its class. A front-firing port is perfectly matched to the cabinet and woofers, the front placement design creates ideal airflow with minimal distortion. The use of MDF Cabinet with brushed Polymer Veneer finish lends to the contemporary aesthetic with absolute durability that results in a seamless integration into any decor. Dual 5-Way binding posts provide sturdy, versatile and high-quality terminals that reap the benefits of bi-wiring and bi-amping. A strong, flexible, removable grille adds a rich, refined look that is acoustically transparent. We are an authorised Klipsch dealership, so you can be assured of receiving genuine products Features. Fills medium to large rooms with powerful, lifelike performances. Dynamic 1 aluminium Linear Travel Suspension horn-loaded tweeter. Dual 8 copper-spun high-output IMG woofers. Brushed black polymer veneer cabinet. Nominal Impedance: 8 Ohms Compatible. Mated: 90x908 square Tractrix Horn. LF: Dual 6.5 copper spun IMG. Finish: Brushed Black Polymer Veneer. Dimensions (HWD): 991 x 198 x 345mm. Weight: 19.02 Kg (41.9lbs). This is the last pair of these loudspeakers we have of this iconic model, now it is discontinued, so this is your last chance to get a pair. Dual 6.5 copper-spun high-output IMG woofers. Orders placed on a Friday morning will be delivered on the Monday. Orders placed after 2pm Friday will be dispatched on the following Monday. Which is highly recommended for its costs and efficiency. We will always aim to do the best to resolve any issues. We aim to provide a fantastic shopping experience for all our shoppers. If you are pleased with the service you receive then please leave feedback accordingly, it really helps us as a small business. We understand that mistakes can happen, and we are more than happy to resolve any issues that may arise. View these items & similar. Audio Affair 23 Gibb Street Custard Factory Birmingham B9 4AA. Sign up for exclusive offers. The item "Klipsch R-26F Speakers Floorstanding Tower Audiophile Large Reference Warranty" is in sale since Monday, August 20, 2018. This item is in the category "Sound & Vision\Home Audio & HiFi Separates\Speakers & Subwoofers". The seller is "hifi-madness" and is located in Birmingham. This item can be shipped to United Kingdom, Austria, Belgium, Bulgaria, Croatia, Cyprus, Czech republic, Denmark, Estonia, Finland, France, Germany, Greece, Hungary, Ireland, Italy, Latvia, Lithuania, Luxembourg, Malta, Netherlands, Poland, Portugal, Romania, Slovakia, Slovenia, Spain, Sweden, Australia, United States, Canada, Brazil, New Zealand, Israel, Hong Kong, Norway, Indonesia, Malaysia, Mexico, Singapore, Switzerland, Taiwan, Thailand, Chile.